The Nicholson Heritage Association is excited to announce that renovations will commence on the Nicholson Tourism Center at the Historic Delaware, Lackawanna and Western Railroad (DL&W) Railroad Station. 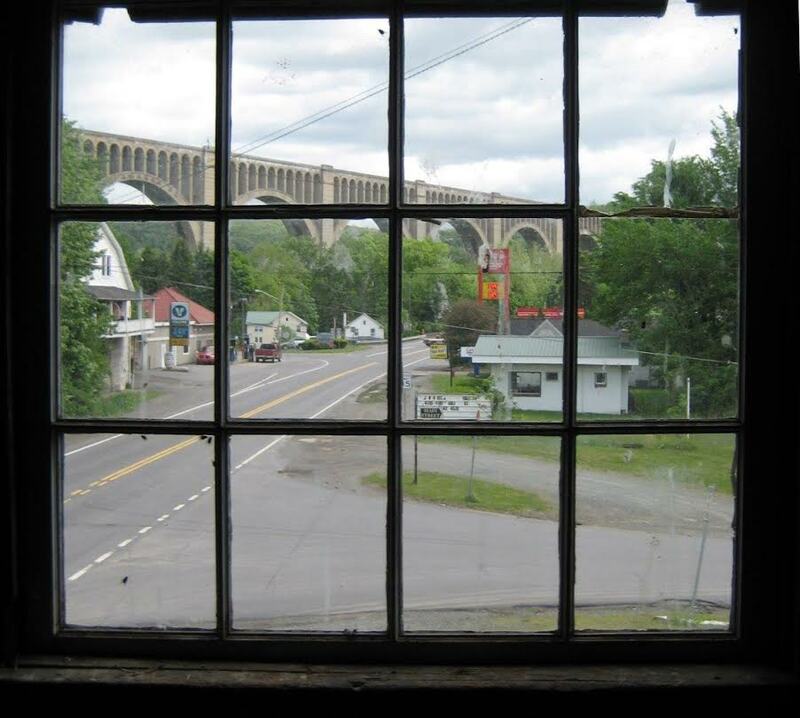 In late 2014, this historic transportation facility preservation and community economic revitalization project received a Pennsylvania Department of Transportation (PennDOT) Transportation Alternatives Program (TAP) grant for preservation and rehabilitation of the historic train station. The three bids received in response to the June 2018 call for bids were reviewed by PennDOT and Perry’s General Contracting, Dunmore, base bid of $1,154,000 was selected. While this is more than the original grant amount awarded, PennDOT is fully funding the project. The Nicholson Heritage Association is required to cover inspection costs. The Association purchased the station in June 2012, with donations from individuals, businesses, and a $25,000 Pepsi Refresh Project grant. In 2014, the Association held two public meetings, to present and discuss the results of the feasibility study, funded mainly in part by a grant from the Endless Mountains Heritage Region with PA Department of Conservation and Natural Resources funds. The designs are complete and possible in part to a Tom E. Dailey Foundation grant. 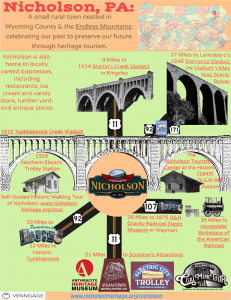 Reuther+Bowen, a highly accomplished and diverse engineering, design, and construction services firm in Dunmore, PA, has been working with the Nicholson Heritage Association on the project, including the designs. 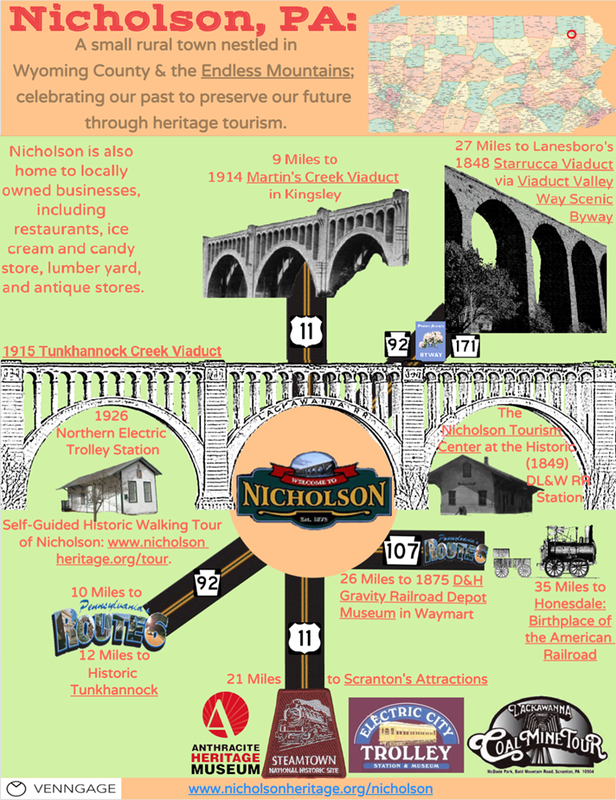 The Nicholson Tourism Center at the Historic DL&W Railroad Station will revitalize the region by attracting tourists to the station, the Tunkhannock Creek Viaduct (also known as the Tunkhannock Viaduct or the Nicholson Bridge), Nicholson, Historic Tunkhannock, Wyoming County, and the Endless Mountains. 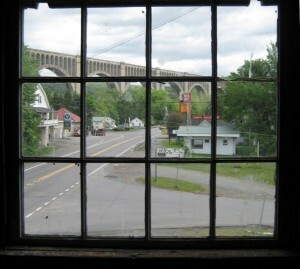 The station also will attract visitors to the region by linking to the area’s railroading and transportation attractions, including the Martins Creek Viaduct, Viaduct Valley Way Scenic Byway, Starrucca Viaduct, Steamtown, Anthracite Heritage Museum and Iron Furnaces, Electric City Trolley Museum, Lackawanna Coal Mine Tour, D&H Gravity Railroad Depot Museum, and Honesdale: the birthplace of American Railroad (see infographic below). It will also be used for community events. 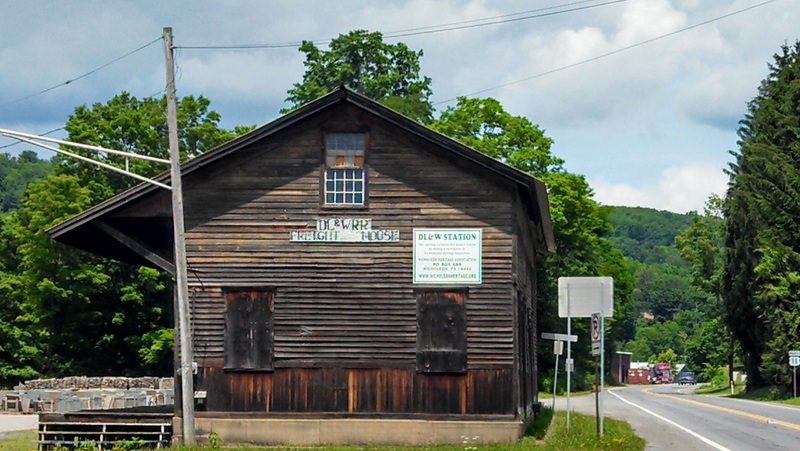 While the TAP grant provides the funds needed to rehabilitate the station, donations continue to be needed and are greatly appreciated, either by mail to the historical group at P.O. Box 496, Nicholson, PA 18446 or PayPal. Please visit http://www.nicholsonstation.org for more information, including a list of supporters.